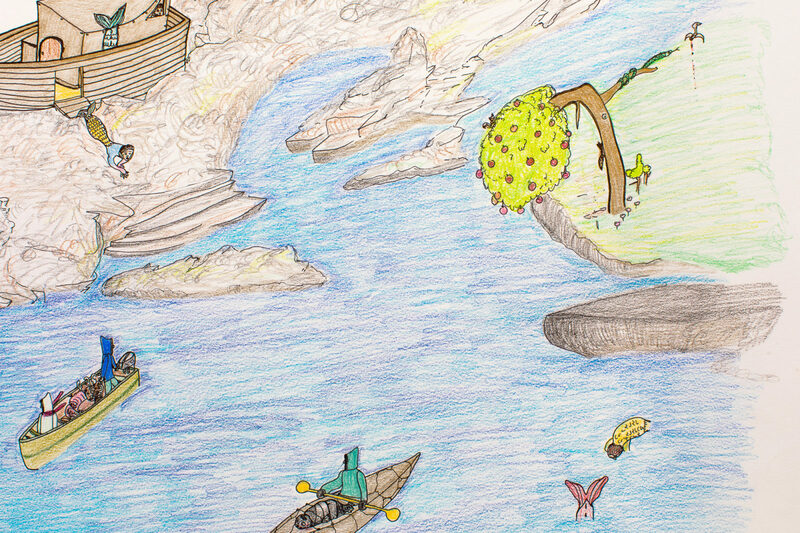 Composition (Purple Bird Transformation), 2010, color pencil, ink, paper, 24 x 63 in. 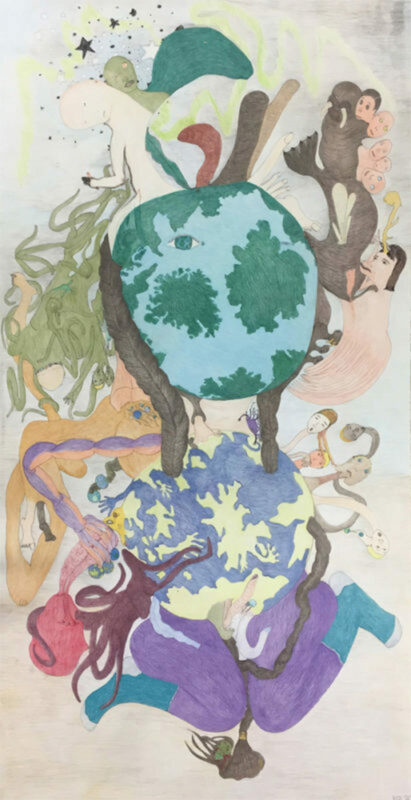 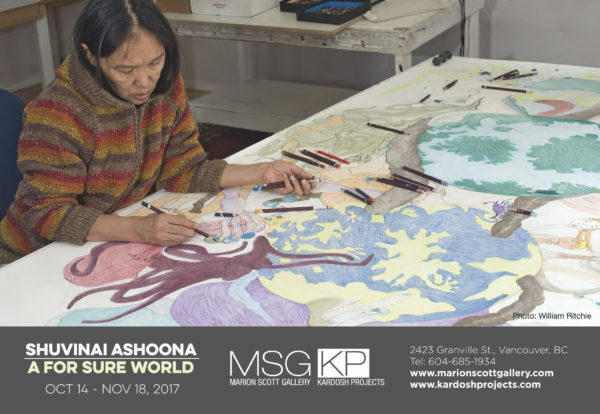 untitled (mother earth), 2016, color pencil, graphite, ink, paper, 90.75 x 47.75 in. Bear Mountain, 2016, color pencil, ink, paper, 32 x 76 in. 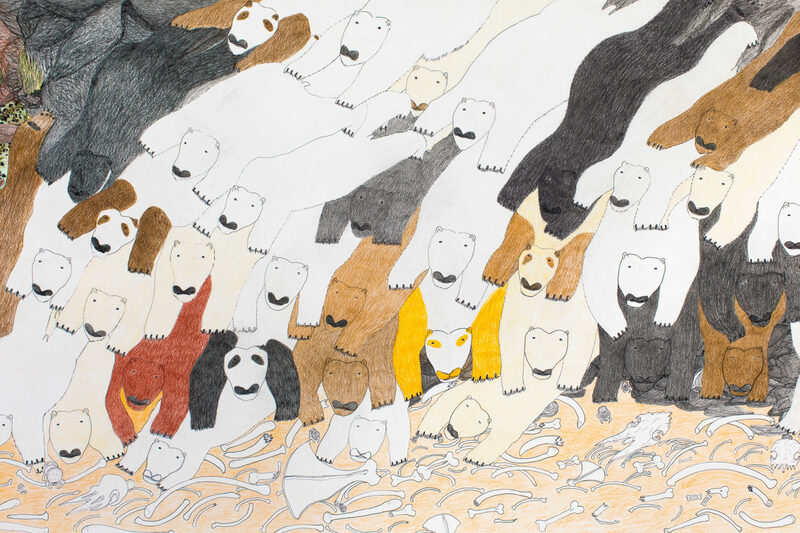 Bear Mountain (detail), 2016, color pencil, ink, paper, 32 x 76 in. 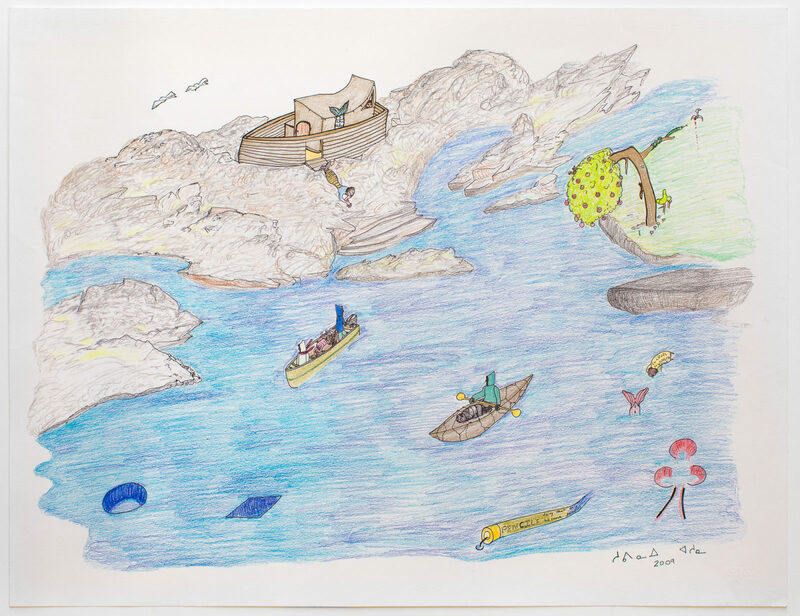 untitled (landscape with boats and tree), 2009, color pencil, graphite, ink, paper, 19.75 x 25.5 in. 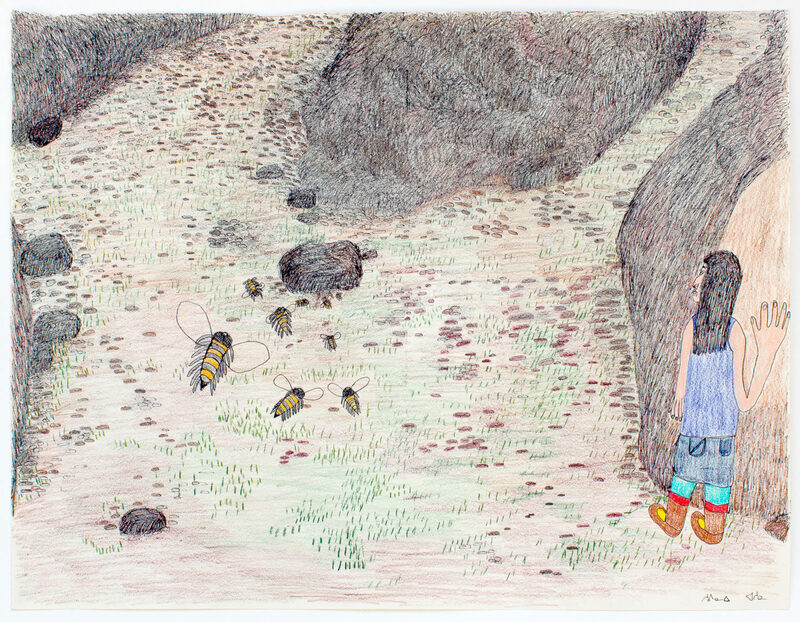 untitled (woman and bees), 2003-04, color pencil, ink, paper, 20 x 26 in. 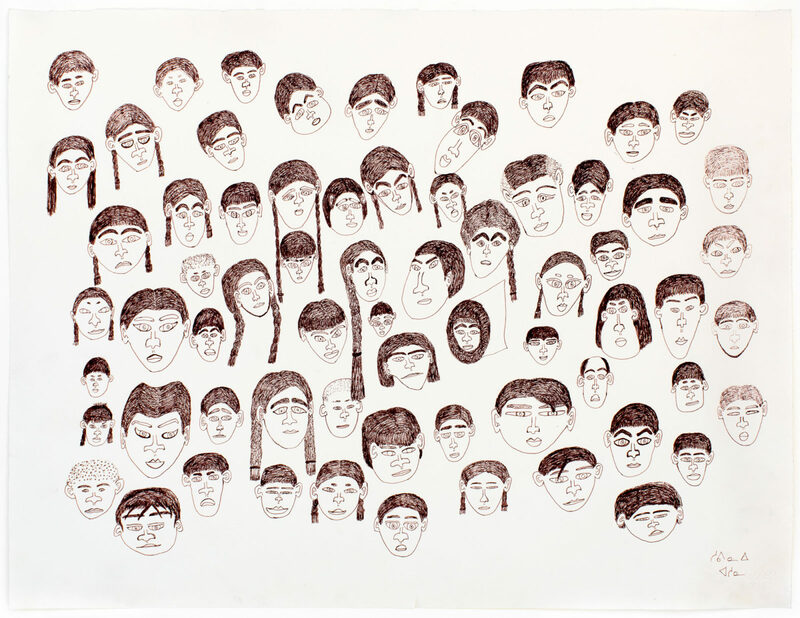 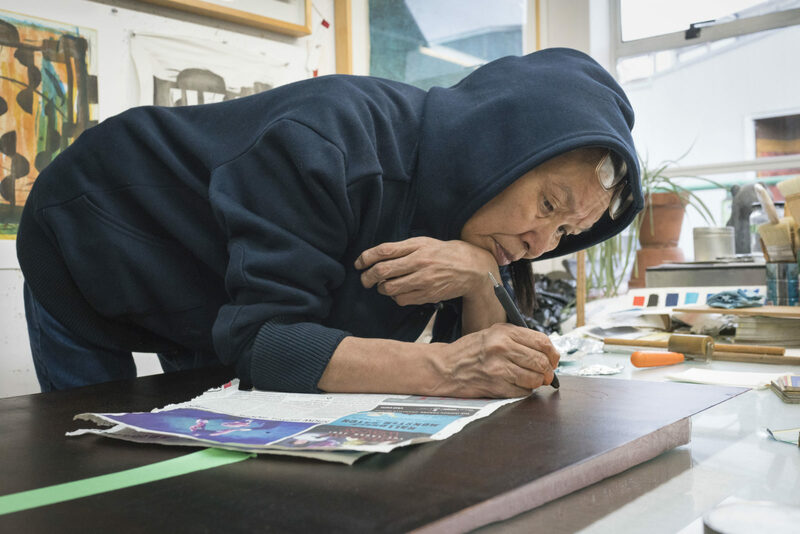 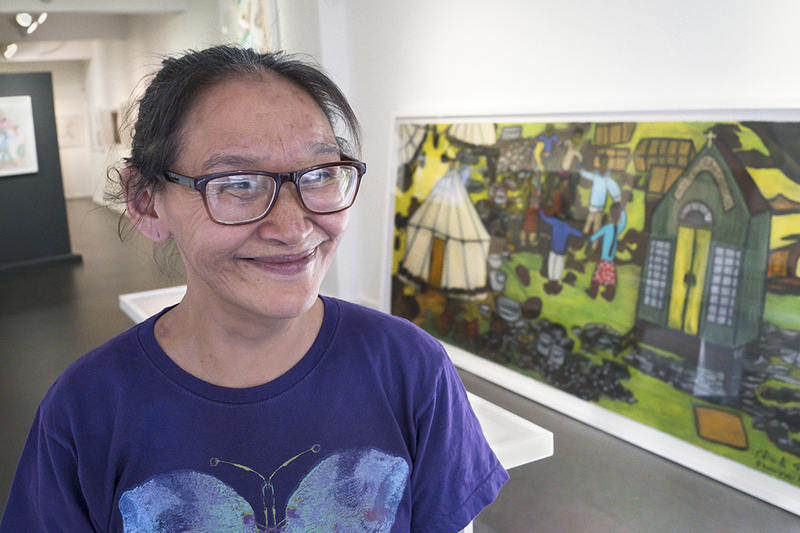 Eden: People of Cape Dorset Trying to Find Themselves, 2004-05, ink, paper, 20 x 26 in. 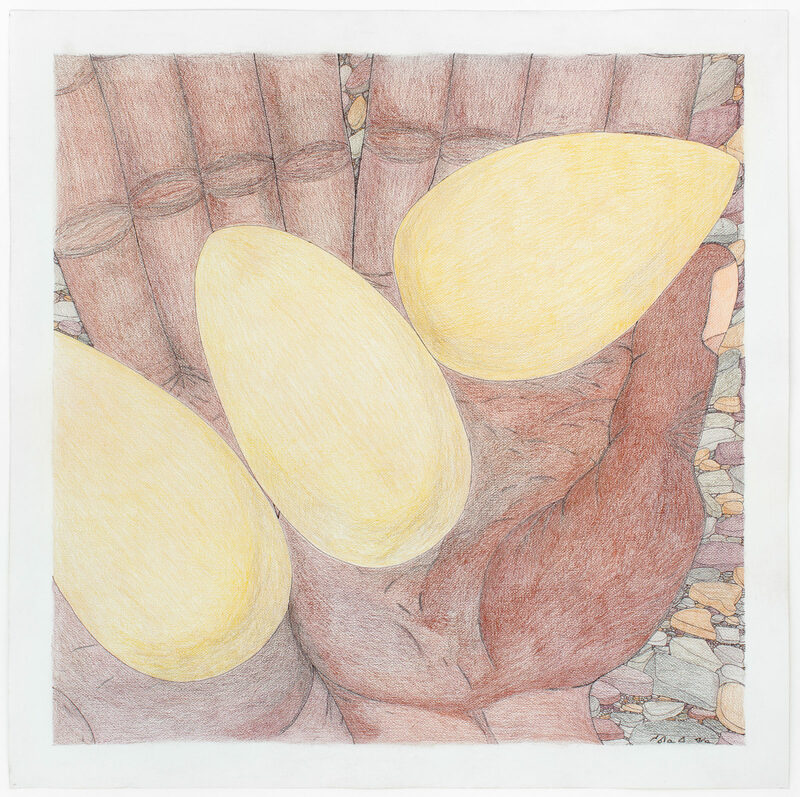 untitled (hands with eggs), 2004-04, color pencil, paper, 36 x 36 in. 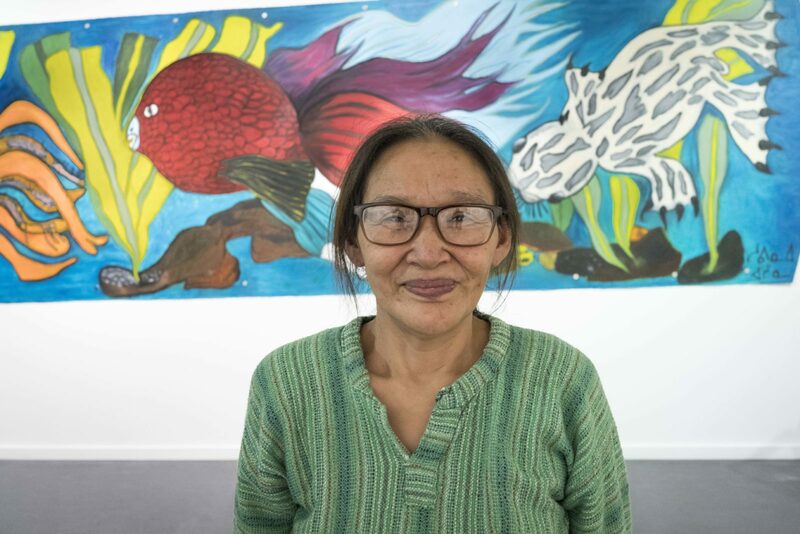 "The brain is like an egg, each day cracking while talking." 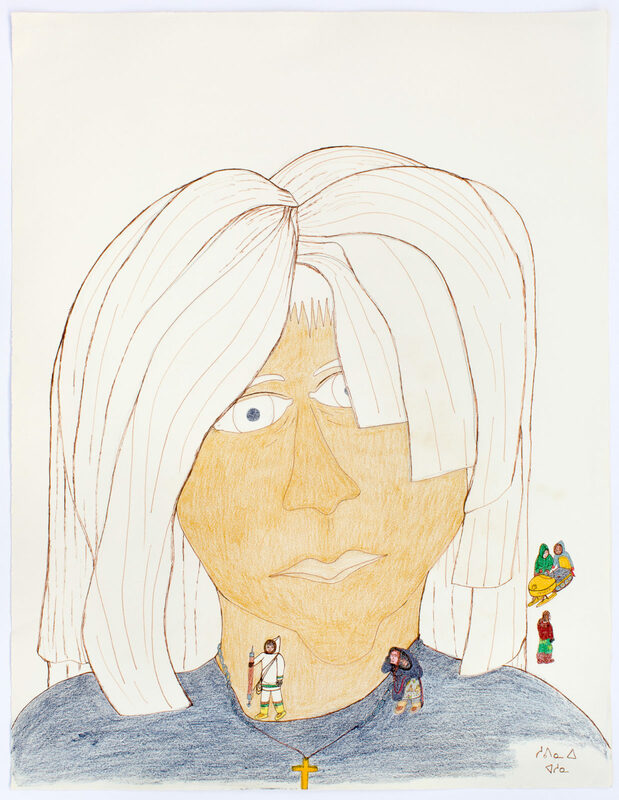 untitled (woman with small figures), 2004-05, color pencil, ink, paper, 20x 26 in. 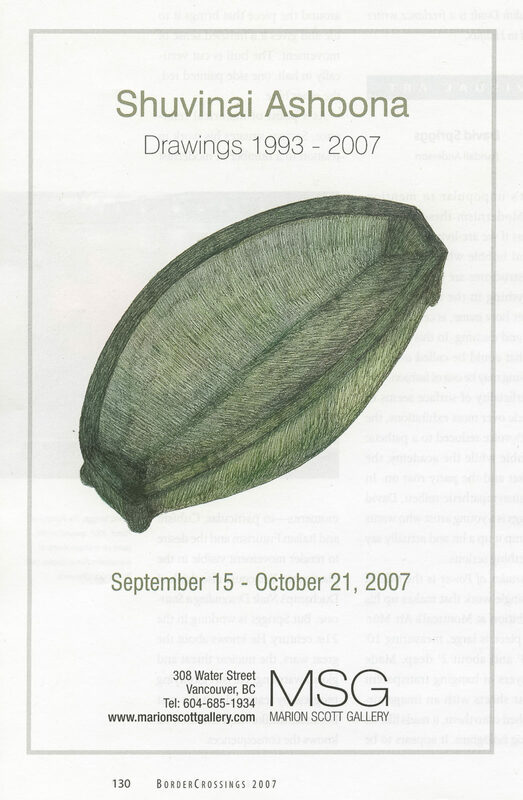 untitled (kudluq - oil lamp), 2004-05, color pencil, ink, paper, 20 x 26 in. 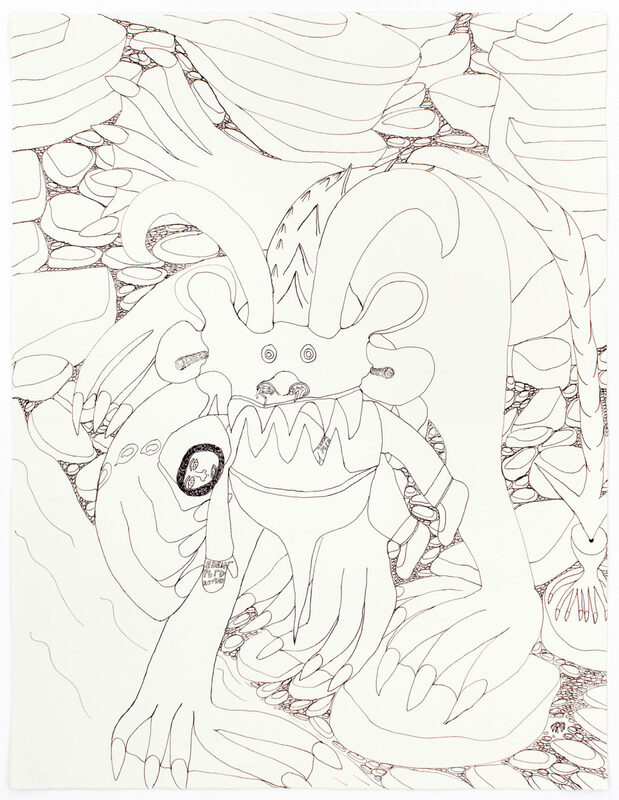 untitled (fantastical landscape), 2001-02, ink, paper, 20 x 26 in. 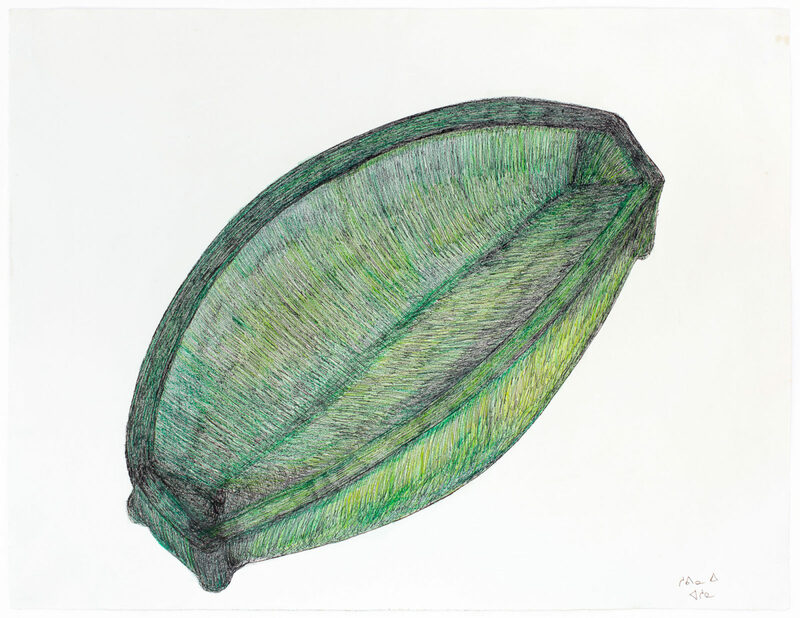 untitled (softening skin), 2005-06, color pencil, ink, paper, 22 x 30 in. 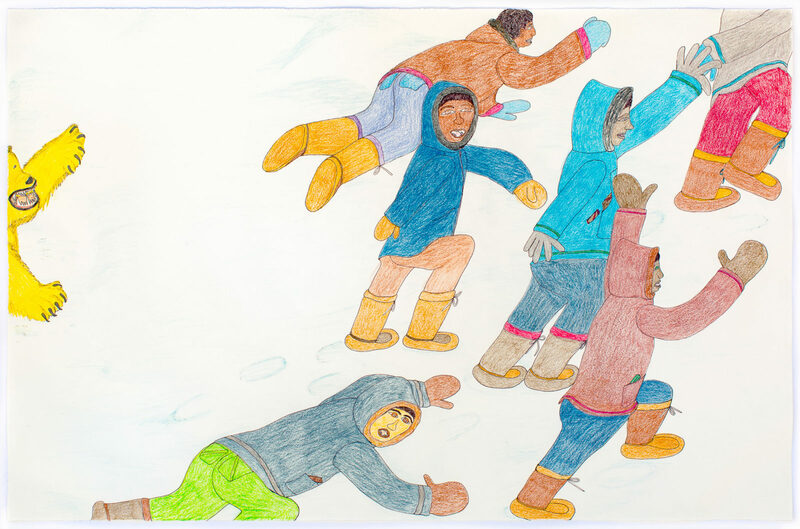 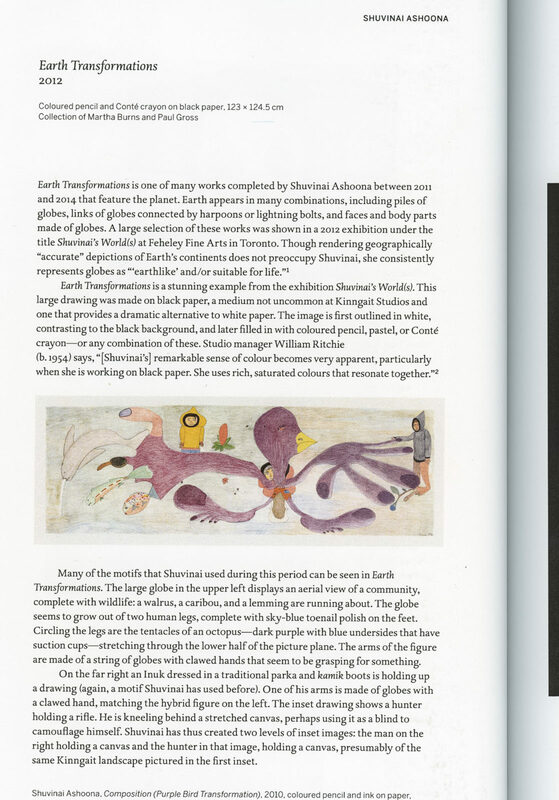 untitled (people fleeing polar bear), 2005-06, color pencil, ink, paper, 26 x 40 in. 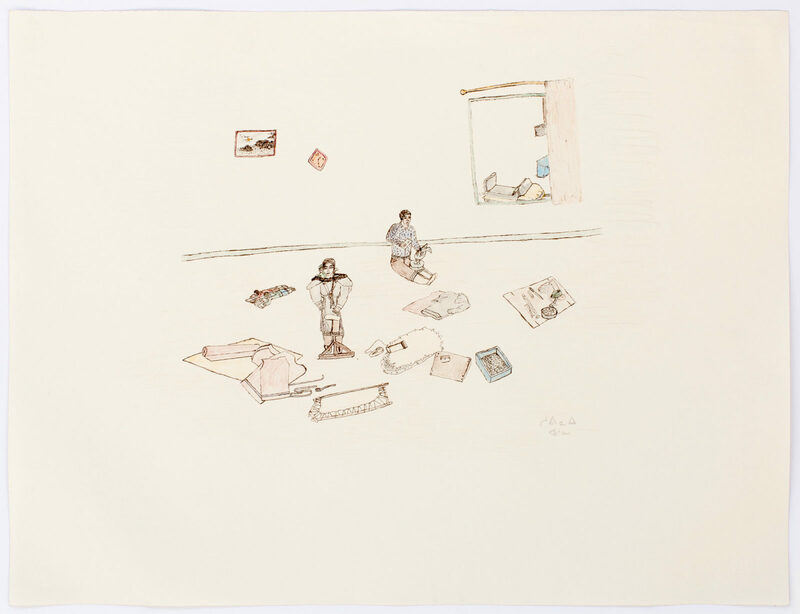 untitled (interior with carving), 1995-96, color pencil, ink, paper, 20 x 26 in. 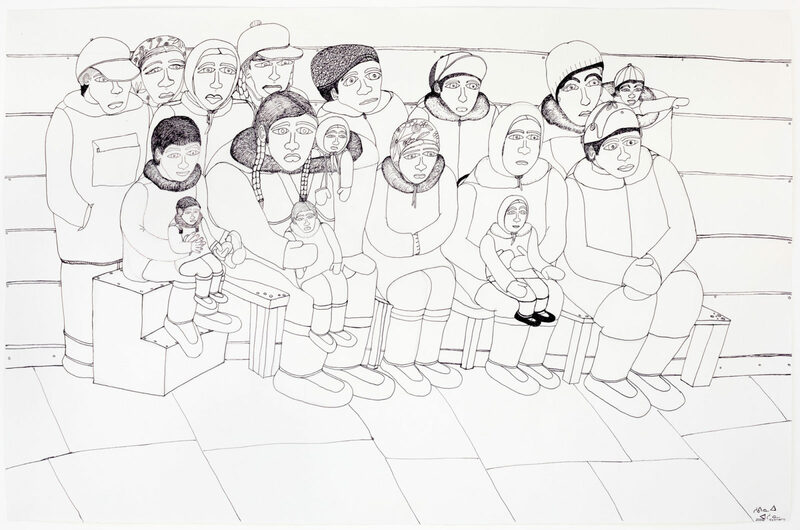 untitled (seated group portrait), 2005-06, color pencil, ink, paper, 26 x 40 in. 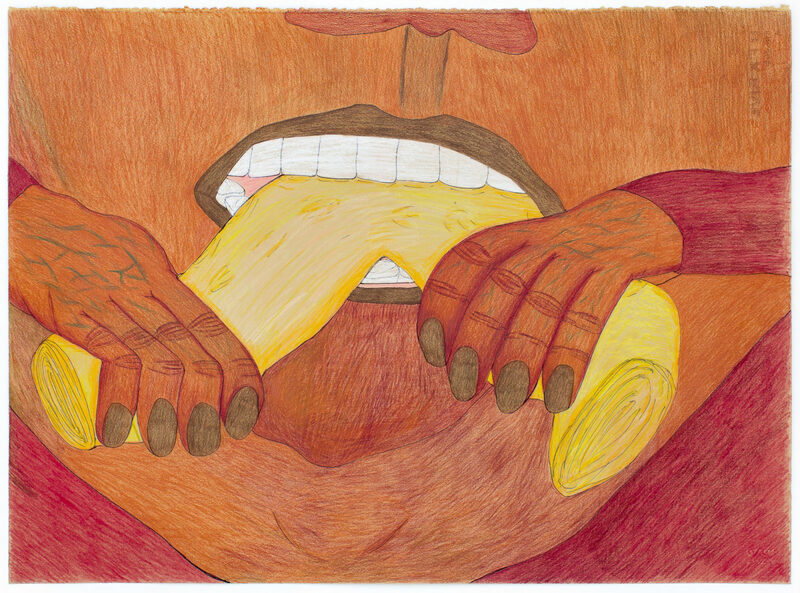 untitled (self-portrait), 2005-06, color pencil, ink, paper, 13 x 40 in. 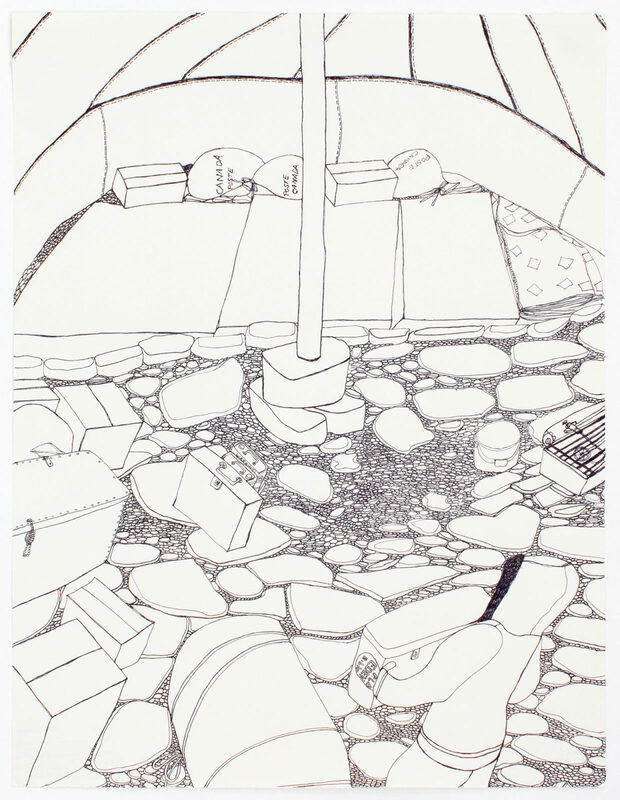 untitled (setting up camp, with Eden mitt ), 2004-05, ink, paper, 20 x 26 in. 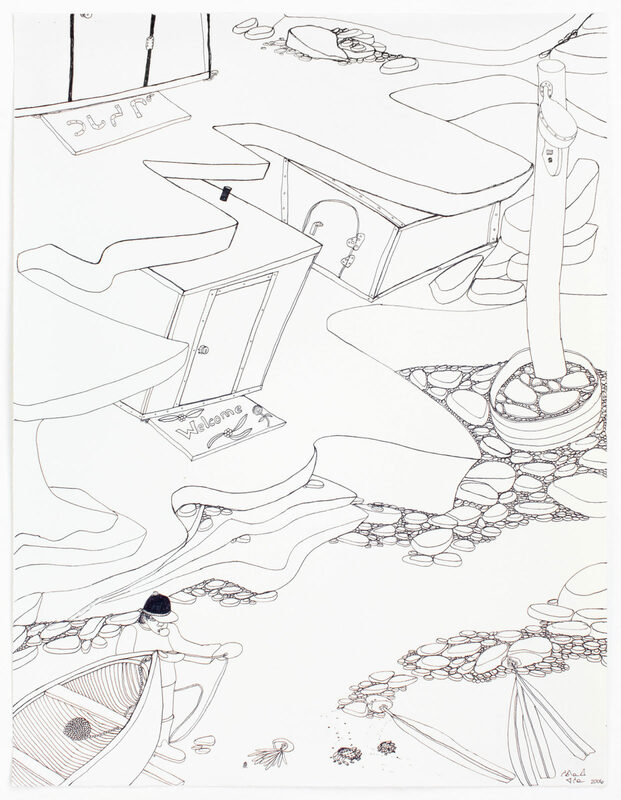 untitled (welcome), 2005-06, ink, paper, 20 x 26 in. 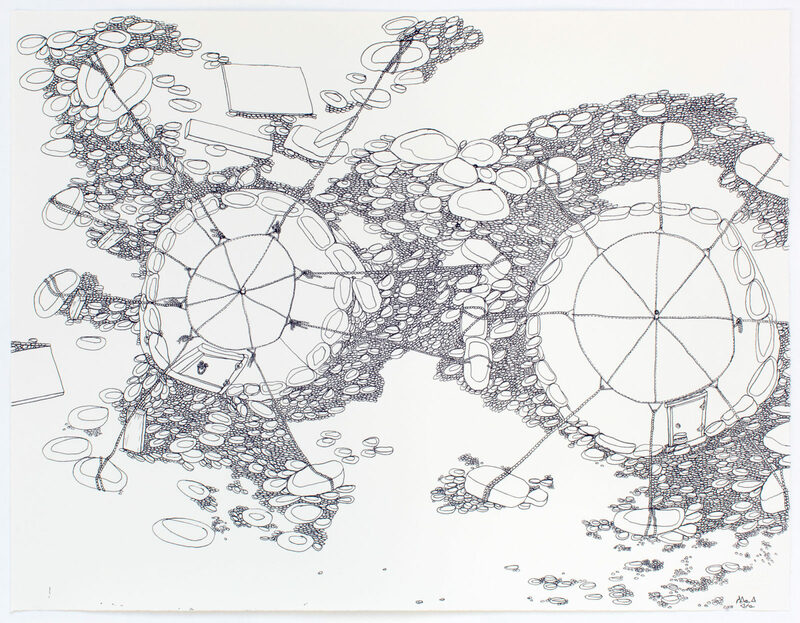 Traditional and Contemporary Dwelling, 2005-06, ink, graphitel, paper, 26 x 40 in. 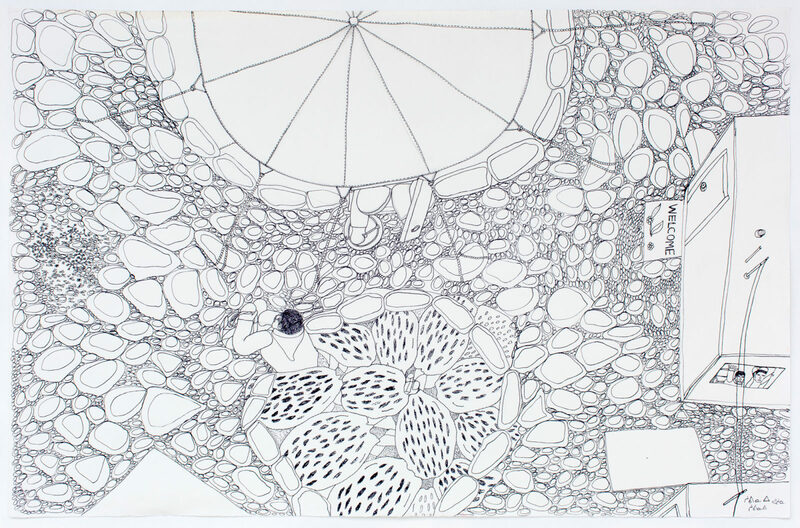 untitled (camp view from above), 2005-06, ink, paper, 20 x 26 in. 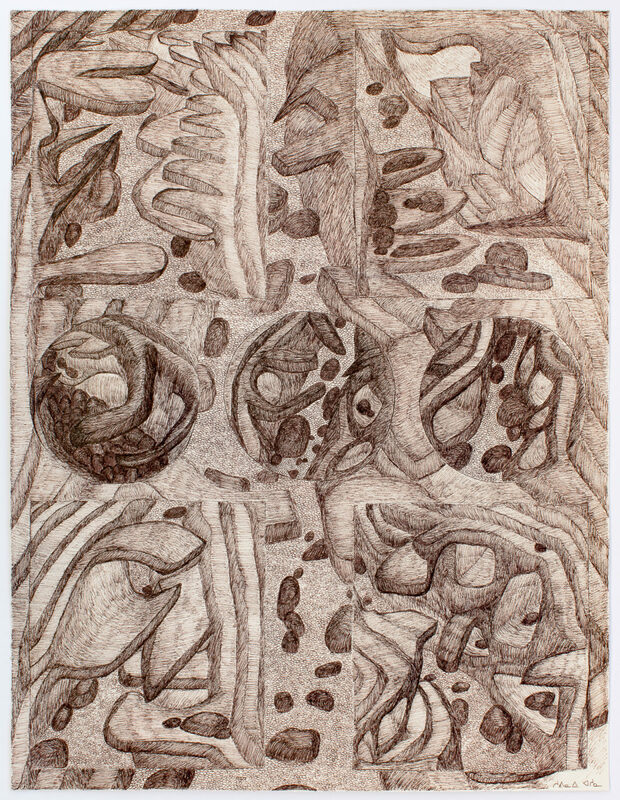 untitled (faces), 2005-06, ink, paper, 20 x 26 in. 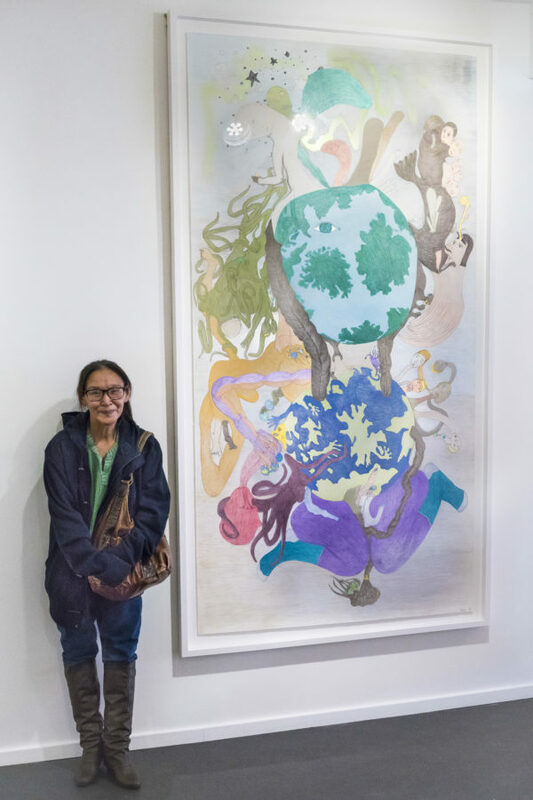 "The brain is like an egg, each day cracking while talking…"